If you love sports gear and sneakers, then you will love a discounted Champs Sports gift card! Same great sportswear for less money out of your wallet- what’s not to love? Not only do they carry shoes for basketball, casual, running, and training, but they also have boots, sandals, and slides! What’s more, you can get yourself a pair of new release Adidas in your style or a pair of Jordans- for less money! One of the largest chains of mall-based athletic footwear and clothing in the United States, they have everything you need to express your athletic style. What’s more, with departments in men, women, boy, girl and brands, you can find something for the entire family. 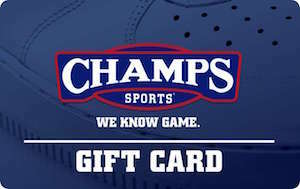 Buy your discounted Champs Sports gift card today, and you’ll get more for your money! That’s right: shoes, clothing, accessories and fan gear without putting a dent in your wallet! With 517 retail locations throughout the United States, Puerto Rico, and the U.S. Virgin Islands, there’s sure to be one located close to you! We know how important it is to have the right gear to express yourself, and with a Champs Sports gift card, you can get the look you want, without breaking the bank! And don’t forget, gift cards make perfect presents too! Why would you pay more for the very same gear? Buy your Champs Sports gift card and pay less on your entire purchase! Cards2Cash also offers discounted gift cards for many other retailers. Check out our Listings for Foot Locker, Lids, Champion, Nike and more! With Cards2Cash, all your sports and style needs are covered- for less money! Do you have a Champs Sports gift card you would like to sell? Cards2Cash pays top dollar for gift cards! Visit one of our retail locations for on the spot payment OR fill out our online form and we’ll get back to you with an offer you won’t refuse. Cards2Cash is your one-stop gift card shop!